THIRTY-FIVE YEAR-OLD TWINS, ANTHONY AND DOMINICK UCCELLO HAVE A UNIQUE BOND, NOT ONLY BECAUSE THEY ARE FRATERNAL TWINS, BUT BECAUSE THEY HAVE JOURNEYED THROUGH LIFE AS BEST FRIENDS AND TAKEN ADVANTAGE OF ALL THAT LIFE HAS TO OFFER TOGETHER. JINXI CADDEL (OWNER OF OUT OF STEP B00KS AND ALL ROUND G00D EGG) UNCOVERS THEIR QUITE REMARKABLE TATT00 STORY. THE TWINS: Anthony and Dominick Uccello are adventure seekers and love to snowboard, surf, ride dirt bikes, hike, and play music (they used to be in a three-piece punk/reggae band) After moving to California in 2005, they were determined to soak up all that “The Golden State” had to offer and eventually opened their own business together too. As licensed contractors, they own a commercial and residential window tinting company called Sunsafe Window Films. 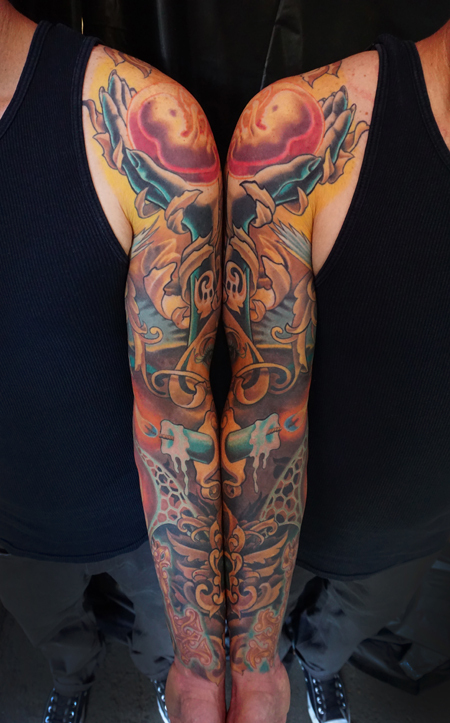 It was during a job that they were hired for at Bearcat Tattoo Gallery in the Little Italy district of San Diego, when their long-awaited dream of creating a matching “twin sleeve” project finally came to life. After working for a few hours on the windows at Bearcat Gallery, Dominick and Anthony started noticing how exemplary the studio was and how inspiring the artists who worked there were as well. They began talking to the owner of Bearcat, Sierra Colt, and it wasn’t long before they realized that he might just be the perfect artist to tell their “twin sleeve” idea to. 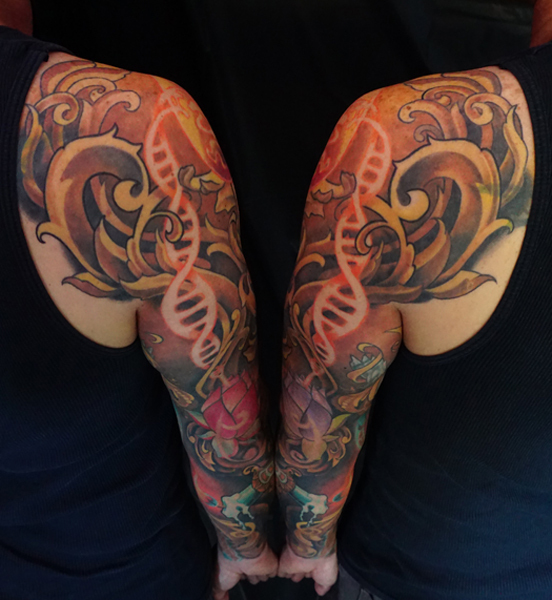 Because the twins have always been so close, they decided years before that one day they wanted to get tattoo sleeves that “matched up” together and encompassed special elements that were important to them. These included DNA, birth, science, their bond as twins, a key to life, a lotus flower, a Holy Spirit bird or peace dove (their last name, Uccello, means “bird” in Italian), a candle burning at both ends, and Mother Nature holding the twin egg foetuses. They started describing the idea to Sierra and he was instantly intrigued and began working on rough sketches soon after. When Anthony and Dominick came back to see some of his designs, they were blown away by how closely he had listened to their vision and how much attention was paid to the details that were so important to them. Sierra was meticulous about planning these sleeves so that when the twins were next to each other, they lined up and almost had a “mirror” effect. 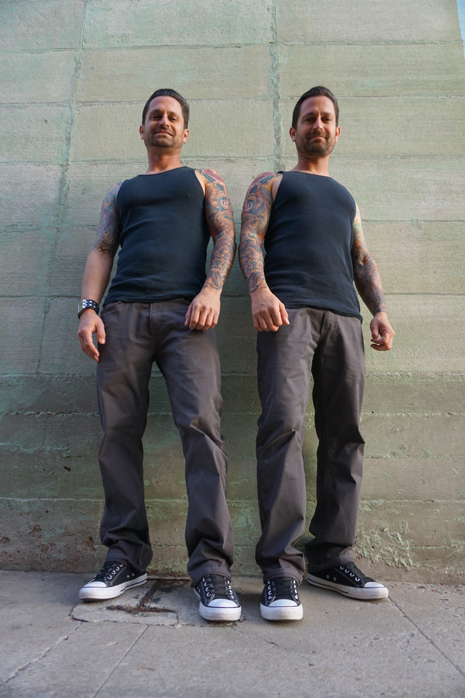 Anthony has his left arm tattooed and Dominick has his right, so when they are side-by-side, they are not only twins and look strikingly alike physically, but the tattoos blend together and encompass all of the meaningful symbolism together as one union as well. The twins really enjoyed seeing Sierra in his true element and said that he would stare at the placement over and over and then say things like, “Nope, let’s place the keys here and the candles there,” starting over and reworking things until they were perfect. While the sleeves do have slight variations, like the key designs being unique and the lotus flowers bearing different colors, for the most part, the designs are breathtakingly similar and the unison that the finished product exudes when viewing them is nothing short of inspiring. Sierra went with warm tones because of the Uccello’s love for autumn and the colors of fall leaves. Dominick describes Sierra as a mathematical surgeon’ who methodically pieced the project together each step of the way. In total, the twins sat for 15 different sittings, three hours each at a time, for a totally of 45 hours apiece. They would plan their sessions in six hour blocks, as Sierra would work on one twin for three hours, take a lunch break, and then recreate the same work on the other twin. Anthony and Dominick noticed that whoever went second on a particular day usually got more done because Sierra was familiar with the design and had learned tricks that were easier to master for the second sitting. He already had the colors mapped out and it would flow easily once he was re-performing the work. On the following visit they would always switch so that things stayed consistent. The end result of this massive undertaking is really an inspiring sight to behold; and the beautiful earth tones and antique filigree leafing around the carefully selected imagery flows so effortlessly on both twins’ arms. They loved Sierra’s idea of the hands holding the foetuses and the connectivity of the images in many spots. The DNA also had a bonus meaning to them because their names D (Dominick) -n- A (Anthony) made for a fun touch. It was a life-changing experience for all three people involved and not only did these two men walk away with outstanding tattoo sleeves, but they all gained insight, inspiration, and even stronger friendship bonds with one another, after working for so many hours as a team. Dominick said that Sierra gave them great business advice for their own company and also inspired them to pursue more of the acting, modeling, and print work that they have tapped into in the past. 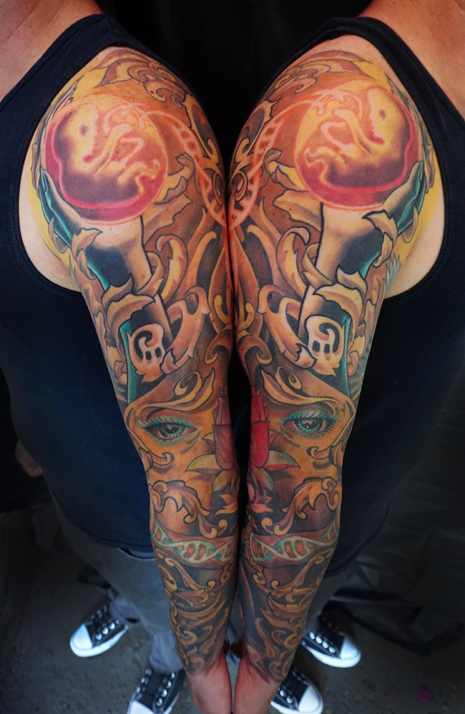 This incredible tattoo experiment ended in two stellar sleeves that are absolutely beautiful and exude powerful bonds of brotherhood and family. 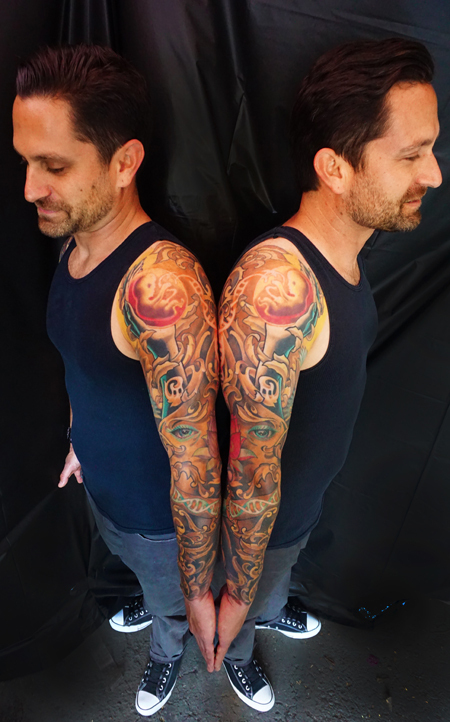 I got to learn more insight about this fantastic project by talking to Sierra Colt, the tattoo artist who brought the tattoo dream’ of the Uccello twins to fruition. Here’s a peek into our conversation. Can you give me a brief rundown about yourself and Bearcat Tattoo Gallery? 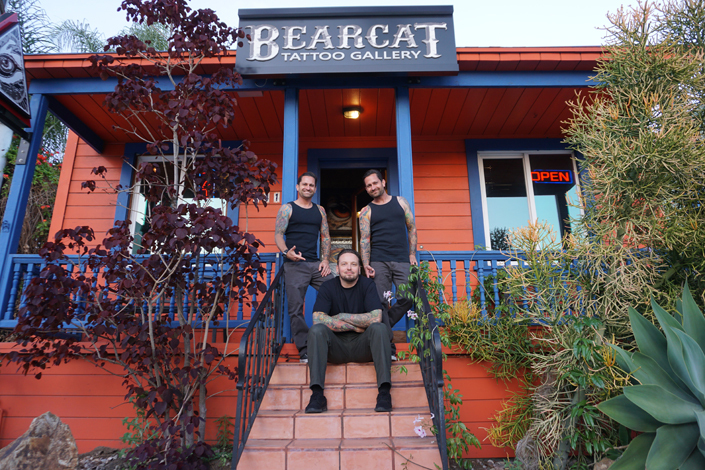 Sierra: I started Bearcat Tattoo Gallery with the goal of creating a unique and comfortable tattoo studio. I wanted our business to be built with a solid foundation of quality and experience, to create an appointment-driven studio. Our clients’ experiences at Bearcat are the most important aspect that we value. We want it to be fun and inspiring; and to always be reaching for next-level designs and concepts. Anthony & Dominick first met you when they were hired to do some window tinting for Bearcat. They said that they were instantly drawn to you and comfortable with you-they loved the studio, the staff, and the vibe there Tell me about your reaction to them and their “twin sleeve” idea. Sierra: I hired them based on their amazing reviews for their company, Sunsafe Window Tinting. The project took a couple of days and they must have picked up on the fun energy around the shop. They didn’t approach me right away about the project. I feel like we started forming a bit of a connection and I was beyond excited when they told me that I was the one for their twin sleeves. We immediately started brainstorming ideas. At first, it seemed very cool. They had cool imagery that I like to tattoo, so I booked them a sit-down consultation and I let the concept evolve in my thoughts. When we all sat down, it was clear to me that we could take this project a step further. I had some ideas of imagery that matched up and aligned, as well as having their sleeves actually twist like DNA as they move in unison. Our consult was amazing. We talked about all the possibilities and I drew on their skin at the same time. I treated their arms like one big canvas. After the skin sketching and brainstorming, I knew the idea was a huge adventure and an opportunity to do something on the next level. Once you decided to take on the project, how did you approach such a detailed and large undertaking? Sierra: I think I went into the project with an open game plan, but confident that I would learn and create a new process as I went. Something I figured out a while back on a different project is that you can draw with both hands as long as you are mirroring both sides. I had the twins stand in front of me and I literally created the flow on both of them at the same time. After initial shape and design, I sat down for a couple of days and created all of the components. Stencil day was a long one, but I took a methodical approach. Slow and steady. 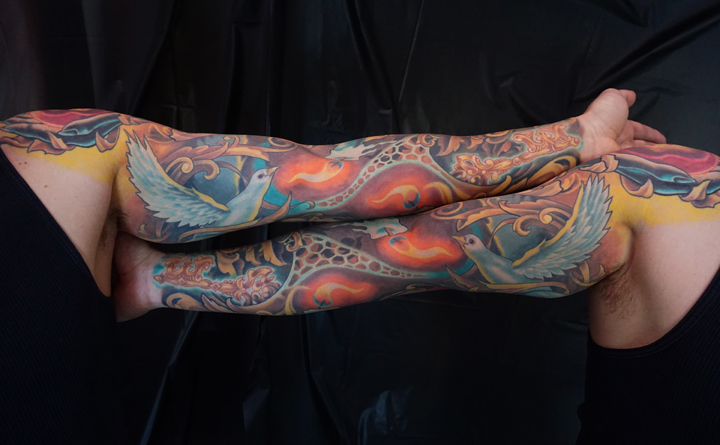 The sleeves look like they flow together effortlessly, but it must have been a challenge to incorporate all of the elements that Dominick 8 Anthony wanted to include while still keeping cohesion and flow to the design. Can you expand on this? Sierra: I think they were both very open to creativity There were a lot of initial ideas and elements. A few of those that were key for them and a few that I really gravitated to. I think the initial idea of two hands holding up the DNA babies like a mother presenting them to the world just flowed out, like it was supposed to be there all along. In fact, think everything kind of took on that flow. It was all created with a smooth connection. How much trial-and-error was involved with the sketches, stencils, placement and achieving that mirror” effect? Sierra: I’d rather be lucky than good, any day. And I have got to say that I’ve been laying solid stencils for years, but we had great luck on our side that day; slow, steady, and methodical. How did the 15 x three hour sittings work? How many months did the entire project take from start to finish? How often did you schedule the twins’ appointments? Sierra: We pretty much went once a month on average. It took a little over a year for the whole project. I think the most interesting thing during the tattoo process is that we learned to do three hours on one twin, then photograph the work and flip the image on my iPad for reference. Then we would do three hours on the other twin. This kept the color and detail very even. And funny enough, the one who went second always got a little more work done; probably because it was repeating same thing the and I was getting quicker the second time around. So needless to say, they switched the order each time. And yes, there were a couple of times where I literally had to look up to see which one I was tattooing at the time. I was lost in tattooing! During this process, what did you learn about Anthony and Dominick and the “twin bond” that they so awesomely exhibit? Sierra: It’s really amazing when you have two people that are genuinely the nicest fellas you’ve ever met. They both are kind and respectful to everyone in the exact way. They have similar tastes and respect for each other’s ideas and thoughts. Sometimes I thought they could have a little external (maybe seventh sense) connection;like they are both thinking in similar ways and connecting without knowing it. Then when conversation happens, they are already on the same page; like they both just thought of something, but not in a “jinx way,” but in a shared consciousness way. It’s a subtle thing, but very cool. I know that the twins both learned a lot from you in the artistic sense but also in the “life lesson” sense. You inspired them to pick up with things they had wanted to do again and they also learned a lot from you in regards to a business perspective. Please share so that more people can read about this incredible tattoo story.